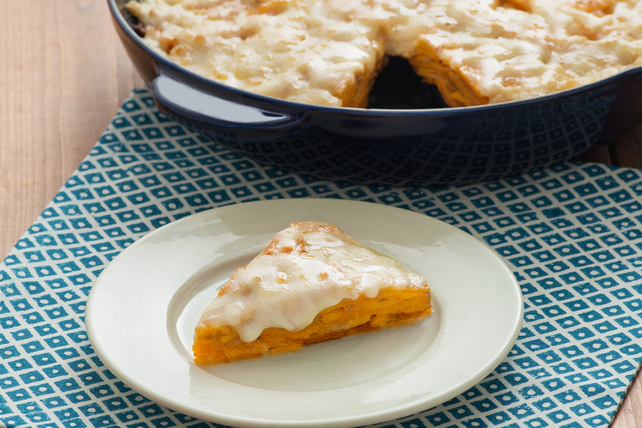 This tasty sweet potato skillet recipe is the perfect side to serve with roast turkey or chicken. Heat 1 Tbsp. oil in large ovenproof skillet on medium heat. Add onions, thyme, and pepper; cook 5 min. or until onions are softened, stirring frequently. Remove from skillet. Heat remaining oil in same skillet on medium-high heat; cover with even layer of half the potatoes. Top with layers of onions and remaining potatoes. Pour 1/2 cup broth over potatoes; cover. Cook 10 min. Meanwhile, mix dressing, flour and remaining broth until blended. Pour dressing mixture over potatoes in skillet; cover. Cook on medium heat 20 min. or until potatoes are tender. Heat broiler. Sprinkle 2 cheeses over potatoes. Broil, 6 inches from heat, 3 to 5 min. or until cheese is melted. Sprinkle with 2 Tbsp. chopped fresh parsley before serving. Season with hot pepper sauce to taste. Prepare using your favourite variety of Cracker Barrel Shredded Cheddar Cheese.